She’s also half-black, which until recently hasn’t caused many problems. She and her family have been living comfortably in Murrieta, a largely middle-class suburb halfway between Los Angeles and San Diego, where Madison plays fastpitch softball on a mostly white team. Everything was turning up roses until last summer, soon after the presidential primary elections. Suddenly, she found herself bumped from starting pitcher to back-up without explanation, despite the fact that she had helped her team win five championships in as many years and continued to exhibit excellent athletic abilities. During games and practice, some of the other parents cast sideways glances at my aunt and uncle, whispering about Madison. It seemed like they felt more comfortable showing their true selves now that Donald Trump was the Republican nominee. The situation steadily worsened in the wake of Trump’s presidential election. As the “Trump effect” swept across the nation, it led to the amplification of hate speech in local communities, including Madison’s own. Ever since, my aunt and uncle have considered the possibility of moving to escape the hostile and unwelcoming environment. So when I heard that the topic for Northwestern’s two-week community dialogue was “Black Lives Matter,” I was pleased that University had finally taken a step toward addressing the challenges students of color face at NU and beyond. 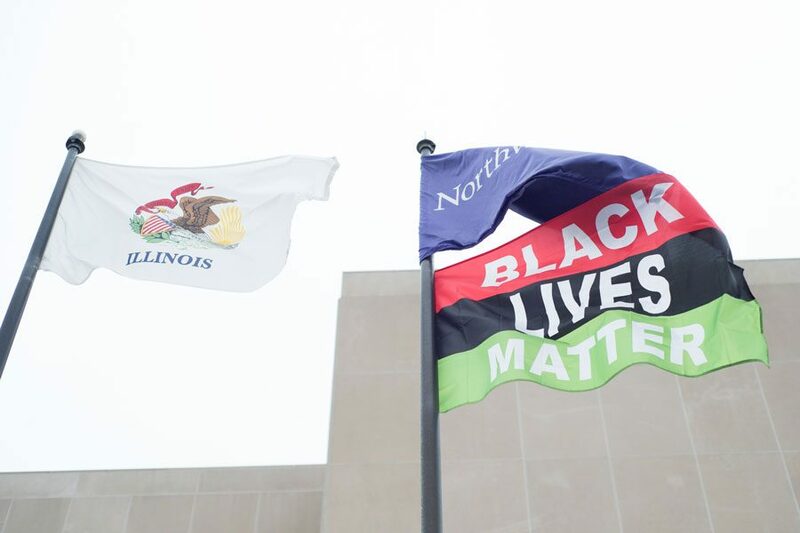 However, when I read that the Black Lives Matter flag flying proudly in front of Norris was set to come down on Jan. 17, just before Inauguration Day, I agreed with senior Danielle Harris, who told The Daily that she would like to see the flag flying over Norris for longer than just two weeks. It seems paradoxical for the University to highlight the diversity of its incoming early-decision students, of which 21 percent, an all-time high, are “black, Hispanic, American Indian or Alaskan native,” without taking an ongoing stance against a sociopolitical climate in which those students face renewed racism and bigotry. At a University where “being the only one” is all too common for black students, according to last fall’s report on the black student experience, it’s necessary to create a more inclusive environment where students are consistently reminded that they attend a campus that takes a stand against bigotry, injustice and discrimination. NU can take a further step toward doing just that by keeping the Black Lives Matter flag raised for the foreseeable future — both to express solidarity with the movement and to signal to incoming students that the University is committed to combatting intolerance. Taking the flag down three days before the inauguration of a man who has thrown derogatory insults at virtually every minority is the symbolic equivalent of throwing in the towel three days before the Little League World Series. The bigger battles lie ahead, and we need to keep moving forward. Keep hoisting the BLM flag so that bright, talented and compassionate potential Wildcats like my cousin grow up in a world where intolerance is consistently discussed and decried. Incoming students should be confident the University will be unequivocally on their side, reassuring them that their lives are valued year-round, not just for two weeks. Chase Reed is a Medill freshman. He can be reached at chasereed2020@u.northwestern.edu. If you would like to respond publicly to this column, send a Letter to the Editor to opinion@dailynorthwestern.com.